Cancellation is allowed only 48 hours before the arrival day, after that cancellation fee is 100% of the first day of total reservation. Note: The payment of the transfer service is in cash but If you would like to pay for the service with a credit card at the reception, an extra 10% will be added to the charge. Note: The rate of the transfer service covers just one waiting hour since the airplane lands. If there will be a delay in the immigration department, lost of baggage or any other circumstance. We will appreciate it, if you would contact us to any of the given phone numbers, in order to still waiting for your arrival; because even if just one minute pass after one hour, the dealer of the parking service in the airport charges for an additional hour. In this case there will be an increase of USD.5.00 (five dollars) for the rate of the transfer service. Welcome to Machu Picchu Suites. 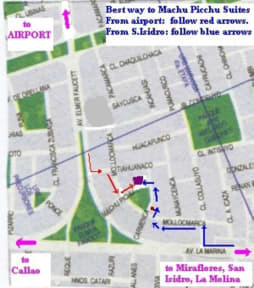 We are located in Lima, Perú, close to the International Airport Jorge Chavez (10 minutes away) in a quiet residential neighbourhood of San Miguel. We are surrounded by important avenues with easy access to the Historical Center, Miraflores, San Isidro, Monterrico and others. Our suites offer you all the comfort you need for a pleasant stay in our city at prices without competence. 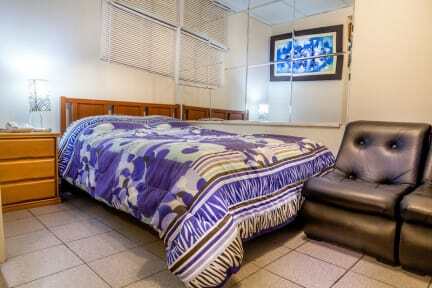 We have beautifully furnished apartments that are fully equipped at low rates (utilities included). Come only with your luggage and here you'll find everything you need. - Television (with cable), VCR, stereo/CD player, telephone, intercom and internet access. - Laundry service, cleaning and garage are optional as they have additional cost. We are located in the district with more commercial development of the city, where you will find important business centres like Square San Miguel and Marina Park. Also nearby are cinemas, restaurants, banks and casinos. Also we can assist you in Spanish, English, French, Italian. Besides, if you'll like we can contact you at the Airport and transfer to the accommodation.